This is a genuine piece I must say. I own few leather jackets in my collection but this feels much better. Soft, stylish and above all, it fits. I wear this jacket when I go to work, go for a coffee or while walking my dog. I am happy with this purchase because it is a convenient jacket for every day. The men styling apparel has now made recognized for women. Presenting you the Han Solo Jacket, which Harrison Ford wore in Star Wars – The Force Awakens, and now here it has been crafted in the same manner just for you ladies. It is detailed in finest way, with neat stitching done throughout and is slim fitting. 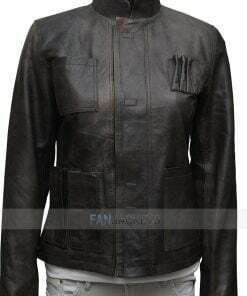 The entire of this Star Wars Jacket is made from Distressed Real Leather, with inside stitched Viscose lining. The only way to make your fashion segment appealing, if you grab this immediately and display it in Star Wars’ way.